In an age where equality is a buzzword for all and sundry, how can washing clothes be only a woman’s domain? Gone are the times when cooking food, washing clothes and doing other household chores was the duty of a woman. In today’s fast paced world where both men and women work in 9am-5pm corporate jobs, there is barely any time to relax. In such a scenario, its unfair to expect either partner to do all the chores at home. And therefore, sharing responsibilities is the best way forward. In Phase 1 of this activity by BlogAdda, women were asked to blog about the startling statistics on the perceptions about washing clothes. The biggest problem with doing laundry or any other household chore is the stereotype associated with it. I am sure all of us would have come across either or both of the above two instances with respect to household chores. Household chores are considered to be something dirty and menial for men to do. This perception sadly exists among large parts of our population. Things are changing though, slowly but surely. And that’s where Phase 2 of this activity comes in. Now is the time for us to be the change that we always claim and strive to be. In my case, I began washing my own clothes once I started my under-graduation. Until then, I didn’t have to worry about washing clothes, ironing and the likes as I was pampered enough to forget about such activities. But as I began a life outside of home, the difficulties began to arise. Whether it was about understanding the way a laundromat functions or the instructions on washing specific kinds of clothes, I learnt so much about washing clothes during my years at college. 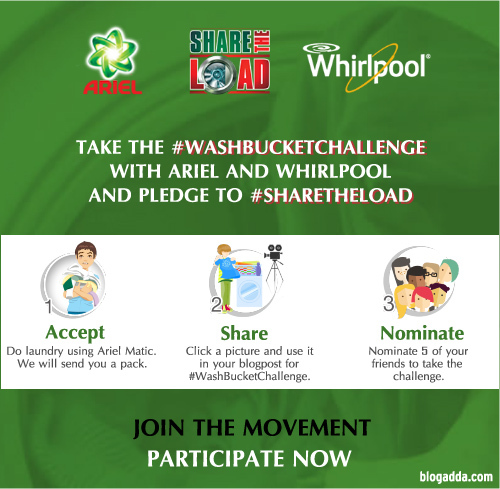 Washing clothes every week was full of many Wash Bucket Challenges. Like all parents, my parents were surprised at my transformation from someone who didn’t bother about such things to someone who had learnt the art of washing clothes. And now, I understand basic stuff like which detergents are good for clothes and which are not, how hot or cold the water should be and so on and so forth. For me, participating in this activity was a no-brainer. How can we just label ‘washing clothes’ as a chore performed only by women? 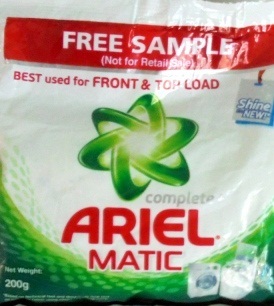 The 200g Ariel Matic packet is an excellent washing powder. Use a little of it and you get clothes which are neatly washed, soft, fresh and smelling good. The result – ‘A happy you’. Linking to NaBloPoMo (National Blog Post Month – April – My post no 1 for this month. Keeping your heart and mind in sync.. Huge respect! I admire men who can manage all on their own. You are right, chores should be equally divided between a couple. Totally! The sooner men from different walks of life realize this, the better it is.. :).